Chain Letter is 192 pages long. It is the story of seven High School friends: Fran, Kipp, Brenda, Neil, Joan, Tony and Alison. They all share a secret: the previous summer they were involved in an accident and buried a man at the side of a desert road. There was nothing that they could do for the man. His troubles were over. But they had their whole lives ahead of them and so they kept quiet about it. They thought that their secret was safe. It appears that they were wrong. Someone knows, because someone has sent them a letter. When the letter turn up in Fran’s mailbox she becomes the first one in the chain. All seven of the friends are in a list on the right of the sheet and the letter says that Fran must perform a task that will be listed in the classified ads of the Times. After she has performed the task she must move her name to the top of the next column on the sheet and then send the letter to the next person on the list (Kipp) She may discuss the letter with anyone else on the list, but with no one else or their secret will be revealed to all. If Fran, or anyone else on the list, fails to complete their tasks then they will be hurt. The letter is signed ‘Your Caretaker’. Of course the letter comes as a shock to all of them and, at first, they suspect each other of playing jokes. Then they suspect each other of sharing their secret with a third party. Fran completes her task and mails the letter to Kipp, who is not so obliging to The Caretaker’s demands, and find out the hard way that The Caretaker’s threats of retaliation were not a bluff. There are some interesting characters in Chain Letter. Tony, for instance, is very athletically gifted both on the track and in the school football team. He is a good looking guy and very popular. The truth of the matter is though, that he doesn’t give a damn about football and he has a lot deeper personality than people think. Neil is Tony’s best friend. He is the sickly one of the bunch and he acts as the group’s conscience about what happened the previous summer. Alison is a beauty and Kipp is the guy with the big nose and a sense of humour. Each character is well developed and has their strong points, along with their flaws. The characters interact well together. There is friendship, there is conflict, and there is even a little romance in Chain Letter. There are also some very sad scenes and some scary ones too. There is a lot happening and the story works well. All the way through I was wondering who the mysterious caretaker was and I was not until very close to the end of the book that I found out the answer. It was a surprise, but Chain Letter contains quite a few surprises within its 192 pages. Did I enjoy it? Yes. Do I recommend it? Yes. Will I buy you a copy and send it to you gift wrapped? Get real! Chain Letter 2 is 159 paages long and picks up the story a couple of months later. Everything was fine and it should have remained so. Then another letter turns up in Fran’s mailbox. The friends can’t believe it. They had already found The Caretaker and it was impossible that The Caretaker could be sending them further letters. Once again they suspect each other of playing jokes. They even wonder if the original Caretaker had an accomplice who is now carrying on the game. The letters are worded the same as the last ones, and they have the same feel to them. Only this time around the tasks that they are asked to fulfil are a lot more sinister and, for some unknown reason, Alison has been omitted from the list. Those who are on the list are now in the third column and from there, if and when they complete their tasks, they will be moved into ‘the box’. And this time around The Caretaker is playing hardball. If the friends don’t complete their tasks they will be killed. There are a few interesting new characters in Chain Letter 2: A young man named Eric Valence, who, with his keen mind, would have made a fine cop if only he could have passed the medical; a mysterious girl named Sasha; and an equally mysterious young man that Alison meets beside a lake. He seems familiar to Alison, but if they have met before she can’t remember when or where. Deep down inside herself though, she knows that she knows him and he seems to have some of the answers that Alison seeks, even if he does present them to her in riddles. 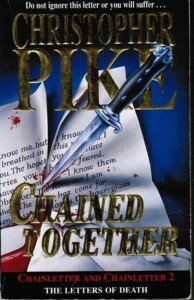 I like Chain Letter 2 and it ends with more of a feeling of closure than the first book did. If the whole story had ended with the first book, it would have been okay. It was a good ending. The way Chain Letter 2 leaves things though, is better. The new characters are great and the old characters haven’t stopped being great, even if they don’t seem to get along together as well as they used to do. But hey, they’ve been through a lot.